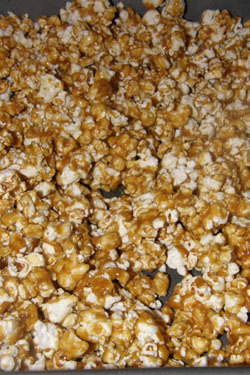 This recipe for Carmel Popcorn is from my good friends John and Mary. It is so easy and fun to make. A great after school treat for the kids. Mix sugar, syrup, salt and butter. Microwave 3 minutes but stir every minute. Add vanilla and baking soda and stir till foamy, microwave 1 minute. Pour over popcorn in a brown grocery bag and shake well. Microwave 1 minute, shake and microwave 30 seconds, shake and microwave 30 seconds. Give a final shake and spread on wax paper to cool. Enjoy, this is the best carmel corn I have ever had, don’t skip corners on this one.